The Holocaust Center and Community Day School are proud to co­-sponsor the second annual WALK TO REMEMBER.This event brings together Holocaust survivors and their families, honors the survivors, and educates the public about the legacies of local survivors. Participants walk the perimeter around Community Day School six times to memorialize the six million Jews killed in the Holocaust. The walk begins at the site of the Gary and Nancy Tuckfelt Keeping Tabs: A Holocaust Sculpture. 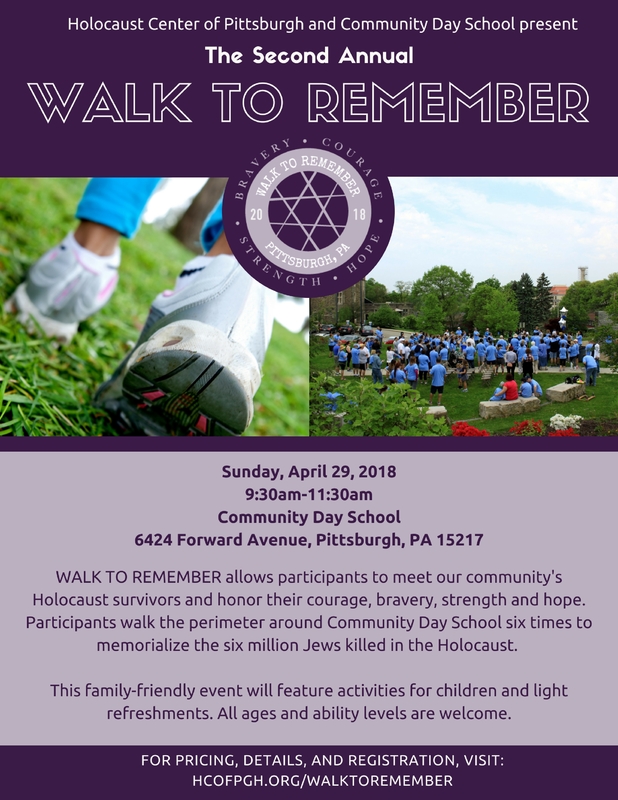 All proceeds from the WALK TO REMEMBER are split equally between the Holocaust Center of Pittsburgh and Community Day School, to fund Holocaust education at both organizations. This is a family­ friendly event, and light refreshments will be served. The event will also include meeting with survivors and tours of the Keeping Tabs sculpture.